skipping along the road with them as we all work to spread the benefits of kids yoga, with love. Shakta Khalsa (the fairy godmother of kids yoga) and Radiant Child Yoga. Friends, I HIGHLY recommend a Radiant Child teacher training to anyone who wants to know more, be more and walk in their direction of their dreams to teach kids yoga, while truly learning to taking care of themselves in the process. Checka Antifonario: a beautiful spirit and soul and teacher in the Boston area and frequent collaborator. Check out Checka’s new guided meditation CDs for ages 3-15! National Kids Yoga Conference Presented by Yo Kids in DC- it’s a great place to meet, learn, laugh and experience kids yoga from all all angles. 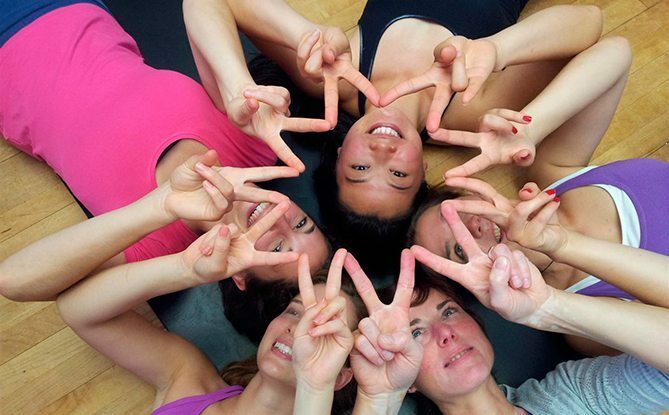 Karma Kids Yoga: THE place to practice Kids Yoga in NYC! Owner Shari and I have done many events together including Yogapalooza episodes. Sadie Nardini: Yogi, Rock Star, Author, Lifestyle Leader. You will always be one of my best friends and you were always in the right place at the right time. Greg Scelsa: A great friend, mentor, musician and music & movement pioneer. Still a top music choice for thousands of teachers. “Life teaches you how to live it if you live long enough”- Tony Bennett. The Secret: The movie that swept the nation (and me!) about the law of attraction. Try to find the original with Ester Hicks, or just sign up for inspiration from Ester and Abraham-Hicks through any of their live events, books, you tube videos or more. They are everywhere, and deserve to be there. Eckhart Tolle: the beloved author of A New Earth and many other powerful books- possibly the most wise and insightful people any of us could possibly learn from. He’s the King.